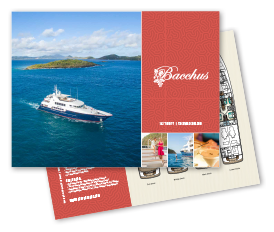 A charter yacht provides the perfect opportunity to celebrate the special moments in life, and 142' Motoryacht Bacchus is designed with a spirit of romance, adventure, relaxation and celebration! Our professional crew of 9 is always prepared for special occasions, from anniversaries to birthday parties and everything in between—your crew loves to organize themed meals or small parties just for fun. We generally start by speaking with our guests before the charter commences to anticipate special events, but we also try to get a feel for the guests’ desires once they arrive. Some guests have an inclination towards formal and elegant multi-course dinners, while others enjoy a festive atmosphere, most like a little bit of both. While on charter we have prepared for a variety of themed celebrations. Our guests’ favorites? Tiki Huts , 1970s, 1980s, Hawaiian Luau, Frank Sinatra, 1920s Gatsby Style, but we can do much more. We are usually well-stocked onboard and we are a resourceful and talented team which helps us get ready wherever in the world we might be. The Preference Sheet always provides an excellent guideline to get to know our guests, but we also work with our charter party upon arrival. Through years of experience we’ve learned that it’s always fun to mix things up. We have often found that charter guests who lean towards the more traditional and formal dinners, also enjoy the opportunity of a beach picnic to experience the laid-back side of the yachting lifestyle. Likewise, we have had guests with young children who are always prepared to go casual, but cherish a glamorous romantic gala evening during their time on Bacchus. Whatever your dream celebration is, come live it up onboard Bacchus and capture the essence of the magical moments in life.